Editors: Stewart, Pamela J. and Strathern andrew J. This companion provides an indispensable overview of contemporary and classical issues in social and cultural anthropology. 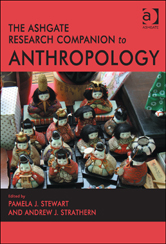 Although anthropology has expanded greatly over time in terms of the diversity of topics in which its practitioners engage, many of the broad themes and topics at the heart of anthropological thought remain perennially vital, such as understanding order and change, diversity and continuity, and conflict and co-operation in the reproduction of social life.